On a bright day in early spring, a group of dedicated citizen scientists stands in a small forest clearing off a popular hiking trail in the front range of the Rocky Mountains, about 75 kilometres west of Calgary, spotting scopes and binoculars trained on the sky. 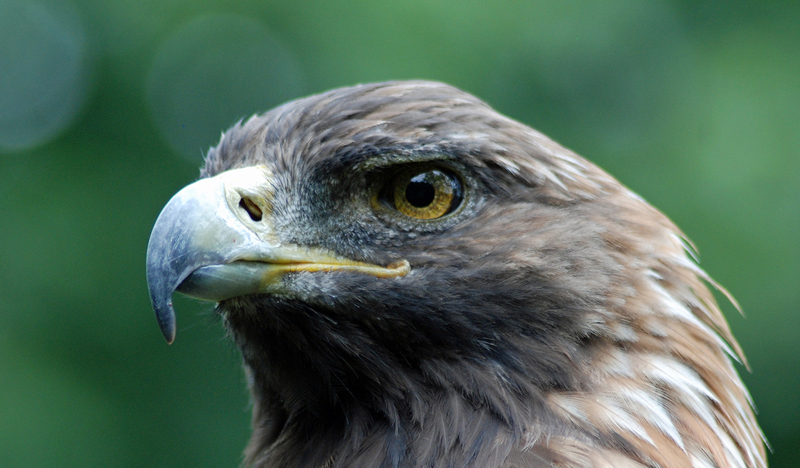 They’re scanning for golden eagles, one of the largest raptors in North America. Sure enough, a speck appears above ‘The Smile,’ a dip in the top of an unnamed mountain peak they’ve called Mt. Patrick after a young volunteer. Everyone watches as the eagle, with its characteristic broad wings and fanned out wingtips, catches a thermal, circles high, and soars overhead. They strain to glimpse the band of white across the tail base that differentiates a juvenile from an adult. Every day in the spring and fall, hundreds of golden eagles stream along the Rockies’ eastern ridges on an aerial highway that stretches from their breeding grounds in Alaska and the Yukon to their winter range as far south as Mexico. In the Cree lunar calendar, February is known as Eagle Moon or Eagle Month, yet scientists didn’t know what route the birds took to get to their winter ranges until relatively recently. “It all happened quite accidentally,” says Peter Sherrington, an avid birder who for more than two decades has spearheaded a massive volunteer effort to track the eagles’ migration. One March morning in 1992 near Mt. Lorette, Sherrington was watching a pine grosbeak through his binoculars when a golden eagle caught his eye. He recorded the sighting of both birds at around 11:30 a.m.; minutes later, two more eagles flew past. By day’s end, he’d counted 103 eagles, and over the next four days, the count would rise to 400. Golden eagles are territorial and have home ranges that can cover as much as 200 square kilometres. They’re found throughout the northern hemisphere, and the majority of populations studied in Finland and Russia appear to be either year-round residents in their habitat or partial migrants, meaning only the juvenile birds travel far afield. The same was thought of the Alaska-Yukon population. Bird counts in the Rockies from the 1970s and early 80s noted anywhere from four to 50 birds per day in the spring and fall. When researchers recorded higher numbers, they assumed they were seeing migrating juveniles, or that inclement weather had concentrated the birds along the front ranges. No one suspected they were watching the largest golden eagle migration on the planet. “When you see something that doesn’t fit with the known data, you assume it’s anomalous, but maybe it’s our knowledge that’s wrong,” Sherrington says. In the fall of 1992, Sherrington began counting eagles in earnest, leaving his oil industry job to start the non-profit Rocky Mountain Eagle Research Foundation, also known as Eagle Watch. At Sherrington’s urging, volunteer eagle watchers fanned out to 16 sites spread over 500 kilometres along the front ranges in Banff and Jasper National Parks to try to confirm his suspicions that the birds were in fact migrating. The response from the birding community was overwhelming, he says. When the results came in, “We had this stream of birds from Jasper all the way to Waterton,” Sherrington says. In the spring of 1993, they counted again, and tallied more than 4,000 birds, including 849 in a single day. Their work continues: to date, thousands of volunteer scientists have logged more than 30,000 hours in the field, and recorded sightings of more than 24,000 golden eagles. They’ve been able to identify not only the migration route along the Rocky Mountain front, but also, working with data from researchers in Alaska and Montana, a secondary migration corridor further west through the Rocky Mountain trench. “The eagles are using the ridges as long, elevated prairie roads,” explains Sherrington. Buoyant pockets of warm air, called thermals, sweep up the ridges, allowing the eagles to gain height while conserving precious energy. During migration season, Sherrington works 17-hour days, compiling data, doing statistical analysis, and writing blogs, all of which he makes freely available on the Eagle Watch website for researchers and volunteers. 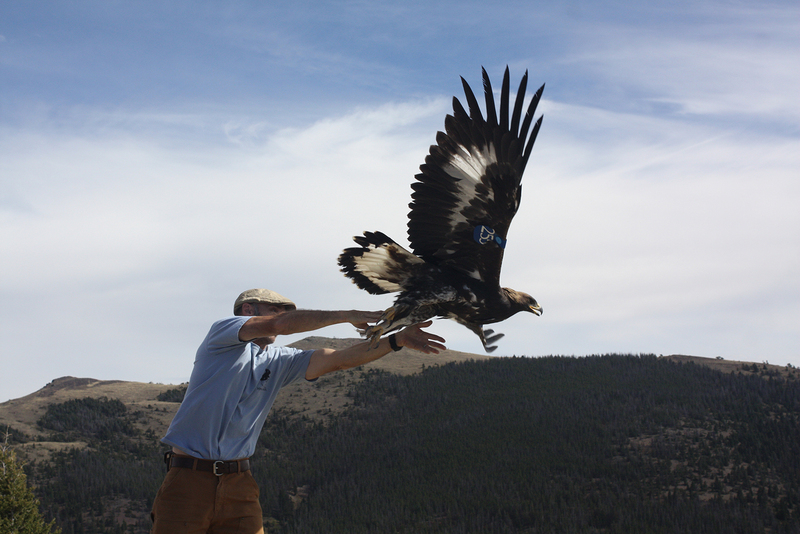 Since 2004, Domenech and the Raptor View team have been affixing numbered tags to the wings of wild eagles in order to make it easier for spotters to identify migrating individuals. Sightings of tagged eagles help fill in the blanks about where the eagles breed and winter, how far they travel, and threats they might encounter along their journey. To get even more precise data, they attach satellite telemetry units to some birds that report the eagle’s location every hour, 12 hours a day for however long the unit functions or the bird stays alive. Between Domenech’s team and other eagle research groups, more than 500 individual eagles have been telemetered to date. These data helped corroborate the migration corridors identified by Sherrington and the Eagle Watch volunteers. Based on Eagle Watch’s 25 years worth of data, the current population of migrating golden eagles is now about 60 per cent of what it was in the early 90s. The eagles face a growing range of human-caused threats: they can be shot, electrocuted by power lines, killed by wind turbines, hit by cars as they’re feeding on roadkill, and caught in traps meant for other animals. Fifty-eight percent of the migrants that Domenech has caught and tagged tested positive for elevated levels of lead. The neurotoxin accumulates when they eat from gut piles left by hunters who’ve killed animals with lead bullets. The birds have lost habitat to agriculture, and their preferred prey species of prairie dogs and sage grouse are also at a fraction of their historic populations. Fortunately, Sherrington and Domenech say they’ve noticed a change in public attitudes toward raptors. Industry and government are also taking note. Efforts have been made to alter power lines by burying them or spacing them out to minimize the chances of these large birds accidentally touching two lines at once. Domenech says their tracking data is sought after in Montana and other western states by industry planners when wind farms are proposed along the eagles’ migration route. But changes happen slowly and ultimately, the birds need protected habitat — no easy feat considering the species travels from as far as northern Alaska to central Mexico. Sherrington can’t hide his frustration about what he perceives as a lack of political will to curtail development and protect critical habitat — and not just for golden eagles. In the meantime, Sherrington, the Eagle Watch volunteers, and other raptor research groups like Domenech’s say they’ll continue collecting data and educating the public about the magnificent golden eagle — and the joy of citizen science. Sarah Hewitt is an associate professor of biology at Mount Royal University in Calgary and a science writer. Her work has appeared in Discover Magazine, BBC Earth, Scientific American and more.